Interested in any of these programs listed below? Contact us for more information. Linking Hearts - extends a helping hand to families who have children with special needs and involves them in a full range of social and Jewish experiences. Challahs of Love - Challah baking with a "twist." The challahs are distributed to families living below the poverty line to grace their Shabbat tables. Bikkur Cholim - Visiting the Sick - coordinating visits to patients at Stanford and community Hospitals. Project Ahava - creates art projects with children in local hospitals. 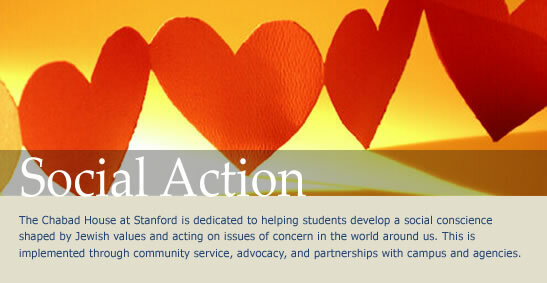 Speaker Series - brings activists to Stanford to share their knowledge and vision on a variety of social issues. Cooking Jewish - learn how to cook, Jewish style. Meditation - explores meditation in a Jewish setting. Drawing on a variety of techniques, including breathing exercises, niggunim/tunes, and Jewish texts, the group provides a space and community for those interested in exploring Jewish spirituality. Have new ideas? Let us know and we can help you put them together.